The letters are threatening in that they tied the continuation of the ECB continuing to provide liquidity funding, to Ireland seeking a bailout programme. In other words “apply for a bailout with close scrutiny of your finances and actions, or we will withhold cash and your banking system and economy will collapse” This is outrageous. Has there been a change of tone at the IMF? There have been a number of statements from the IMF this week which suggest an apparent change in tone towards Ireland’s financial difficulties, now that former managing director and, by the bye, French presidential candidate, Dominique Strauss-Kahn (DSK) has departed the IMF to reconcile himself with the consequences of what took place in his New York hotel room only a week ago. DSK has been replaced on an interim basis by John Lipsky, the American economist with an earlier career with global investment banks. The IMF yesterday announced a recruitment process for DSK’s permanent replacement and say they hope the new appointee will be in place by the end of June 2011; according to the media, frontrunners include the current French finance minister, Christine Lagarde but other names in the frame include former UK prime minister, Gordon Brown as well as non-Europeans like India’s Montek Singh Ahluwalia. Tradition has been for a European to hold the top job at the IMF whilst an American holds top post at the World Bank but that seems as appropriate today as the ban on theUK monarch marrying a Catholic. This week saw a raft of statements from the IMF that directly dealt with Irelandor which certainly pertain to our difficulties. On Tuesday, the IMF announced that it had agreed to release the next tranche of bailout funding which we had requested to be brought forward. That Tuesday statement by the IMF was quite upbeat about the efforts already made by our country to confront our difficulties. I was impressed by what appeared to me to be the IMF sticking its head above the parapets and suggesting that a medium-term ECB facility for our banks was necessary in order that our banks could return to the market for funding. This seems new and potentially creates a rift between the IMF and EU approach to Ireland. We still don’t know exactly what happened the week of the stress test and bank restructuring announcements at the end of March 2011 but it seems that we were desperately seeking a commitment from the ECB for a medium term facility then; remember the ECB is presently providing some €80bn of short-term liquidity funding to our domestic banks and is additionally authorising our national Central Bank of Ireland to provide €70bn of emergency liquidity assistance to our domestic banks. This short term financing is undermining our banking system and as Greece is finding out in quite graphic detail, being in hock to a lender that can pull the plug in seven days is reckless for a nation. But back in March 2011, the ECB unceremoniously dashed any hopes of a medium term facility with its statements in response to the 31st March restructuring announcements. Well, thank God at last that the IMF is making it plain that a medium-term facility is necessary. Press: And you seem to be implying that you also understand or believe this and that without burden sharing from bondholders, be they bank bondholders or people involved in the bank bailout or whatever, without thatIreland’s prospects are very grim. Ajai Chopra: Second, European partners need to make clear that for countries currently with programs there will be the right amount of financing on the right terms and for the right duration to foster success. In other words, the countries cannot do it alone and putting a disproportionate burden of the cost of adjustment on the country may not be economically or politically feasible. The resulting uncertainty affects not only these countries but through the high spreads and lack of market access it increases the threat of spillovers and creates downside risks to the broader euro area. Hence, these costs need to be shared including through additional financing if necessary. Sadly the IMF is the junior creditor in our bailout having a maximum commitment of €22.5bn compared to the maximum of €45bn being advanced by the EU. But securing IMF support for a degree of burden-sharing, for a medium term ECB facility and the maintenance of our corporation tax rate (and by implication its base) should bolster our efforts to emerge from the financial crisis and repay our sovereign debts and share in the repayment of our bank debts. It always struck me that our negotiating team last November didn’t recognize differences in the stances of the various parties and consequently didn’t even begin to exploit those differences. It was also striking that the IMF was hitherto at pains to avoid the perception of any rift or difference of opinion with the EU; the last week has reversed this perception and it is to be hoped that our current negotiators are capable of recognising the changes and developing a strategy which might exploit those differences and deliver a bailout which is sustainable. 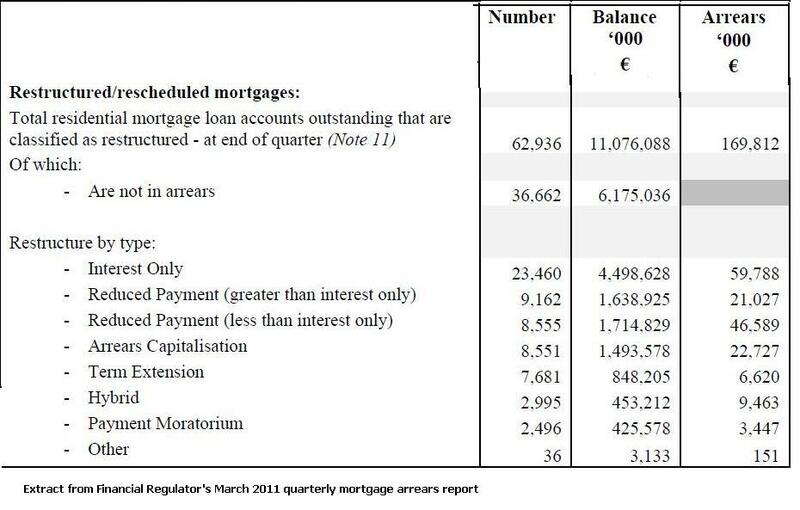 This morning the Irish Banking Federation (IBF), which represents more than 95% of mortgage lending in the State, released mortgage lending date for quarter one of 2011 – the data is here and the press release is here. The figures paint a picture of a property market that is seizing up. Superlatives come in abundance : €577m was advanced during the quarter which is 96.91% down from the peak in Q3, 2006; the average investment mortgage is now €144,000 which is 56% down from peak and indeed 24% down from the previous quarter which is indicative of fire sales or tightening in lending criteria; just 15 mortgages a day were advanced to First Time Buyers (FTBs) during the quarter. The numbers are pretty bad. Of course the stress test and bank restructuring announcements were made at the end of March 2011 so any positive effects of these announcements will not be captured in the figures released today. As for the outlook, there is a commitment by the incoming government to ensure there is €10bn of new lending per annum in the economy over the next three years and NAMA has flown a kite that it may part-fund purchases of property from its portfolio. The economy remains decidedly weak though the ESRI broke ranks last week and suggested GDP might grow by 2% in 2011. The Allsop/Space auction on 15th April, 2011 laid bare the extent of the decline in Irish property prices with achieved results suggesting we were (unscientifically) 60% off peak actual prices. Generally falling wages, stagnant population due to emigration and the market-distorting effects of NAMA, restraint on repossessions and bank foreclosure sales are all making for a dysfunctional market at present and it is hard to see any significant recovery in lending figures in quarter two. The IBF numbers are significant though in their implication on the rental market. If potential buyers are sitting on their funds or are unable to get loans, then renting is really the only alternative which might strengthen demand and stabilise prices. Recent data from DAFT.ie and the CSO suggests that rent levels are stabilising. And here are the numbers. First up, loan volumes (that is, number of new mortgages advanced) – RIL means Residential Investment Loan. And lastly the average of each loan advanced. You CAN’T equate this with average house price because we don’t know the proportion of the purchase price accounted for by the mortgage (was 100% and more during the peak, is typically 70-92% now). There is no reason for anybody to take out loans and commit themselves to years of misery especially when we don’t know what new taxes the government are going to invent .baring in mind we expect to have a new property tax and new water charges imposed on all of the hapless homeowners in the country .Perhaps they will introduce a new window tax and what about a shower tax ,maybe even a new tea tax ! Having had a quick look at the property details and with prices pitched close to the €300 psf, it doesn’t seem as these are bargain basement. It should also be remembered that these may not be NAMA-backed properties, but I would have said the betting would be that they are. Interestingly it is the Fleming Group that is handling the sales rather than an estate agent. Various companies within the Fleming group have had receivers and administrators appointed. Last month, the Irish Examiner reported that a substantial Fleming development in Wembley, north London had apparently been sold by administrators, Baker Tilly. John Fleming, the founder of the Fleming Group applied for bankruptcy in the British courts in December 2010. Your right about the prices these are not bargains in fact I am willing to bet anyone buying these properties will be facing negative equity in a few months let alone in a year. Even at half the asking price you are been robbed .The Fleming Group will have to face reality and step down from cloud cuckoo land. Why has ECB raised its main interest rate from 1% to 1.25% today? As expected it has just been confirmed that the ECB is raising its main refinancing operations rate from an historic low of 1%, where it has rested for the past 23 months since May 2009, to 1.25%. The general betting is that further rate rises will be implemented in the coming months. Why? Although it mightn’t feel like it in Ireland, or indeed Greece or Portugal, Europe on an aggregate basis is recovering from the 2007-8 financial crisis. 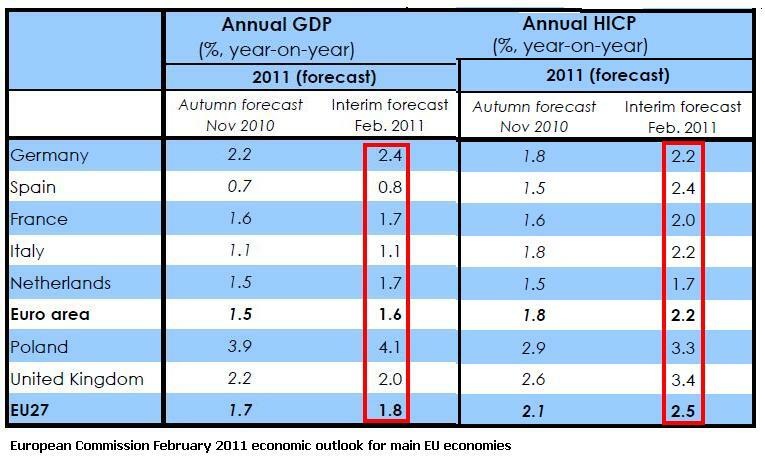 This is what the February 2011 European Commission forecast was for the main EU economies. Whilst our GDP in Ireland fell by 1% last year – making it three successive years of drops totalling 12% off peak GDP in 2007 – Germany’s economy roared ahead with GDP growth of 3.6% in 2010. Our government might officially say the outlook is for 1.75% GDP growth in 2011, but the EU thinks it will be 0.9% and even the upbeat Morgan Stanley-produced “Ireland – a Time to Buy” analyst note on Monday this week anticipates GDP growth in 2011 of just 0.8%. Mind you, our inflation has been picking up in recent months but is still just 0.9% in February 2011, the lowest in Europe (that is, using the inflation measure which excludes mortgage interest – factor that in and even we were at 2.2%). So the reason the ECB is raising rates now is to cater to the bigger economies in Europe, and that’s how the euro works. Arguably we are in the present state of distress because of the application of the same principle in the early 2000s when Germany was experiencing sluggish growth and Ireland was continuing to experience Celtic Tiger growth in GDP and inflation. If we had our own currency, there might have been a better chance of increasing interest rates to cool demand but because we were out of sync with Germany, that didn’t happen. Of course we have benefited from membership of a common currency in the sense that our old currency, the punt, was hardly seen as a significant currency and we have cut down exchange rate risks and cost. And political controls might have been exerted in the 2000s to curb the growth in credit. Still, on days like this, you would wonder if the bargain to join the euro was worth it. Ireland has 785,000-odd mortgages of which an estimated 400,000 are tracker mortgages so today’s announcement will have an almost immediate and widespread effect. If your tracker is ECB + 1.5%, then on a €250,000 mortgage, your repayments, simply calculated, are likely to increase by €50 per month (€250,000/12 * [2.75%-2.5%]). Minister for Finance, Michael Noonan will no longer be able to comfort us with the mantra about the ECB providing €100bn liquidity to our banks at 1%. The prospect of even higher interest rates in the EuroZone will also tend to strengthen the euro with sterling (at 0.874 this morning), and the UK is our main trading partner. Well if we needed another example of whom really the ECB is working for . We in Ireland need this interest rate rise like a hole in the head, what utter nonsense. This rate rise is stupid it is pushing up the euro in value and soon we should see the euro /Dollar at 1.50 and even beyond. Have these guys a death wish? Maybe the Germans want the euro to collapse. It is hard to see what the big picture here is with the events in Portugal now showing the truth about the banking problem all around Europe I wonder if the Germans are creating the justification they will need to walk away from the Euro Experiment. This has dealt a death blow to the recovering property market here in Ireland and it only confirms that we are about to see the next leg down ,hold on to your hats a storm is about to hit us real hard!